Angeles Wine Agency is a wine distributor based in Southern California. They specialize in importing wines from the Rhone Valley, Burgundy, Alsace, Italy, Spain, Argentina and Australia. They also represent wines "by interesting Artisan producers from Napa Valley, Sonoma, Anderson Valley, Monterey, Paso Robles and Santa Barbara," according to their website. 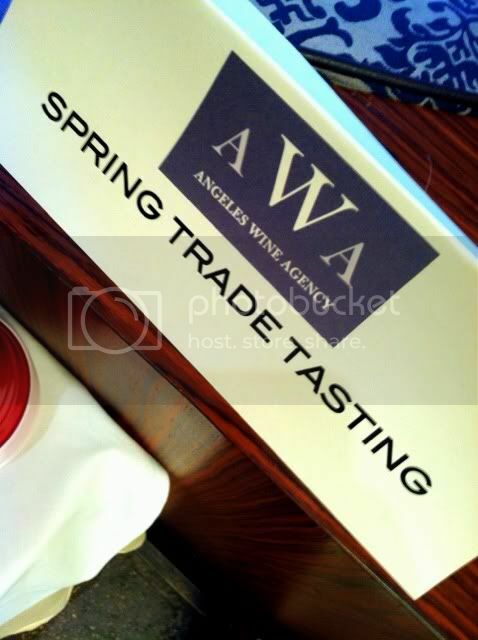 AWA put on a trade tasting in West Hollywood at Ago Restaurant on March 19, 2012, which I was invited to attend. I found a great mix of new and old world styles which allowed guests to taste through the spectrum of the wine world. It was a pretty great way for a wine lover to spend a Monday afternoon. A lot of wine lovers thought so, as the jammed the patio area at Ago. The event got off to a great start with a table devoted to rosé wines from Provence. A half dozen bottles - any of which would be welcome on the deck this summer - were highlighted by the dry and floral Château Routas Coteaux Varois Rosé 2011 and the earthy Domaine de la Fouquette Côtes de Provence Rosé 2011. Both are from Jeff Welburn Selections. Welburn's main table also featured the lovely, dark, herbal Domaine Fabrice Gasnier Chinon Les Graves 2010. The table featuring AWA's California brands had several standouts. The Anglim Pinot Noir Fiddlestix Vineyard Sta. Rita Hills 2009 is fruity and very smooth with a nice, tart finish. Anglim's Grenache Vista Creek Paso Robles 2008 is a monster, showing big cherry flavor, strong tannins and great acidity. The Palazzo Cabernet Franc 2009 has a nice display of fruit and herbs. The Sunstone Merlot Lot 118 Santa Barbara County 2009 is smoky, dark and earthy. 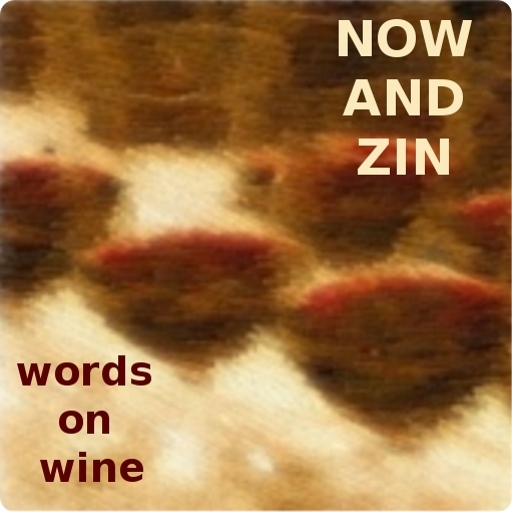 I really enjoyed the ripe, red and spicy Peter Franus Zinfandel Napa Valley 2009. Montecastelli Selections had a table full of Italian wines which remained so crowded throughout the event I could only elbow in once for a taste of the Monteflor Velio Pinot Grigio 2010. The Friuli wine shows some really nice mineral aromas and a nice acidity. It's the sort of Pinot Grigio that makes me want to drink more Pinot Grigio. 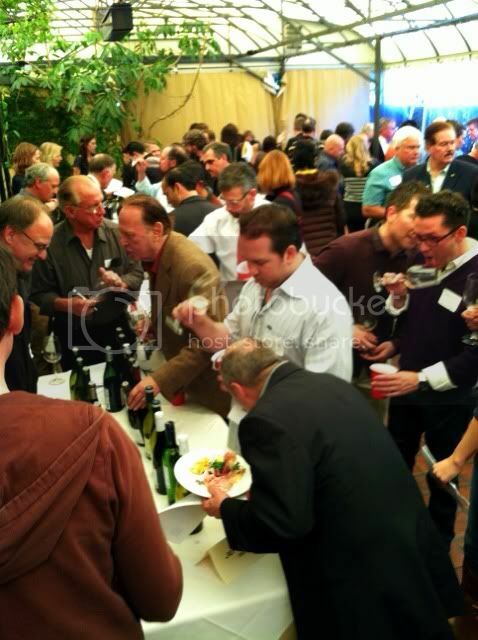 The Wines of France table drew a crowd for their Châteauneuf-du-Pape offerings. The Cuvée du Vatican "Reserve Sixtine" Rouge is tall, dark and spicy, while the Domaine De La Charbonniere "Hautes Brusquieres" digs deep for some extreme earthiness. The Mas De Boislauzon Tintot is 100% Mourvédre, dark and moody. Ole Spanish Selections poured some noteworthy wines. The Bodegas Hermanos del Villar Oro de Castilla Verdejo brings grapefruit acidity from Rueda. Three rugby fans founded Bodegas Rugvino - their Big Bang de Expoto Rioja 2008 is a bright and lively cherry flavor framed by wonderful acidity. Bodegas La Cartuja Priorat 2010 is bold, tannic and toothy. The Grapes of Spain table had a couple of great Ribera del Duero wines. The Bodegas Arrocal 2009 was brimming with dusty roses and cherries with a nice tannic structure. The Finca Torremilanos Montecastrillo Red 2009 smells and tastes of raspberries. Bodegas y Vinedos Maurodos San Ramon Prima 2006 out of Toro brings an enormous showing of smoky blackberry. The campfire sensation persists into the finish. The Argentine wines of Maipe presented by Kysela Selections really impressed me. Their '10 Malbec sees four months in oak and has a fresh fruitiness that's almost grapey in its purity. The '09 Reserve Malbec gets 12 months in barrels and delivers more spiciness as a result. The '11 Torrontes sports a nose that leaps right out of the glass. Its acidity comes from the high, cool-climate vineyards of Saltas. The Maipe 2010 Bonarda shows an intriguing, dark minerality and almost bracing acidity. Last, but - as the cliche goes - certainly not least, were the Bordeaux selections. I tried the Chateau de France Pessac Leognan 2009 and found a nice tannic grip and healthy acidity. Château Laurensanne Côtes de Bourg 2009 is full of flinty, old world earth. Château du Perier Medoc Cru Bourgeois is loaded with minerality and Marquis de Bellefont Bordeaux St. Emilion Grand Cru 2008 shows a fragrant bouquet.